Trust goes both ways. If you haven't reviewed a business on Trustpilot before and want to start doing it, create a user profile. Trustpilot requires all reviews to be connected to an account with a real person behind it. To keep our platform transparent and fair for everyone who uses it – reviewers and companies alike – we want to make sure that the people who review companies are genuine people who've had real experiences. If you don't want to write reviews, but just want to keep reading them to make better buying decisions, that's fine! 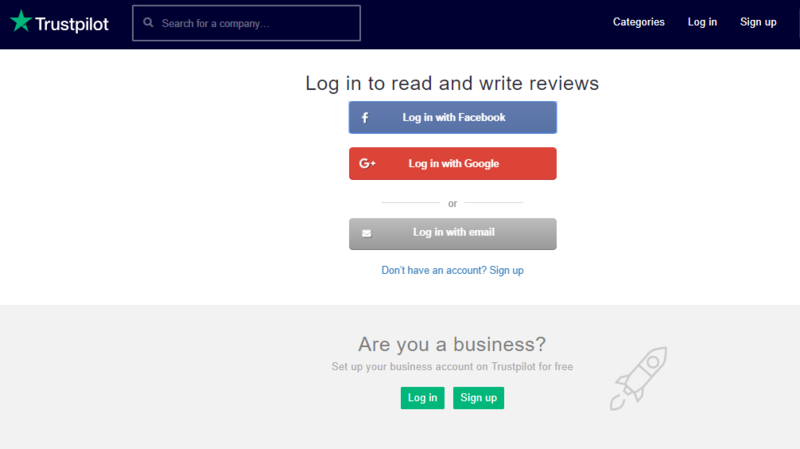 You only need an account if you want to review businesses. On the Trustpilot homepage, in the upper right-hand corner of the page, select Sign up. On the Sign up page, select the Sign up with Facebook button. If you're logged in to Facebook, select I accept the new Terms and Conditions, then select the Continue button. When you register with Trustpilot using Facebook, Trustpilot has access to your friends list and your email address. You can control Trustpilot's access to these features. If you use your full name and a photograph on Facebook, they'll also appear on Trustpilot unless you manually change it in your account settings. Note: Trustpilot never posts anything on your behalf. Once you've logged in with Facebook, you're ready to start writing reviews. Go out there and express yourself! On the Sign up page, select the Sign up with Google Button. In the Sign in with Google dialog, select the Google account that you want to connect to your Trustpilot account. If you don't have a social media account or you'd rather not connect your Trustpilot profile to a social media platform, sign up using an email address. On the Sign up screen, select the Sign up with email button. To activate your account, select the link in the activation email you'll receive. Create a password for your Trustpilot account. Now you're all set. Start writing some reviews! Now that you've created your user account, customize your profile. Change your display name, or edit your social settings to control what information you make public. You can also add a picture to your profile. And if you need some inspiration for writing your first review, we've got some tips on how to write a great review. Welcome to the Trustpilot community! Do I need a user profile on Trustpilot?